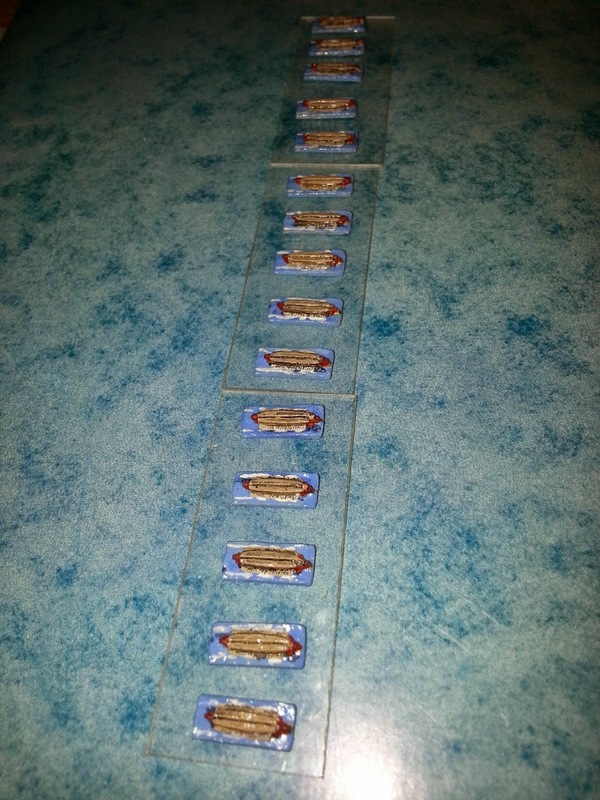 Having taken the plunge, received a flock of minute trieres from Outpost Wargame Services. The initial impression was that I had given up detailed card models for something that was really a marker rather than a model. Closer inspection proved this to be a false impression. The whole fleet of 150 trieres cost a satisyingly slight 300 Kr - 28 pounds. Outpost fleet of 150 trieres. Under examination by eye I still thought the detail was slight and these would be little better than counters. I undercoated them with a thin wash of acrylic white with a touch of brown. Then looked agian. This time the details hidden by the metallic sheen were clear. Suprisingly much detail ! 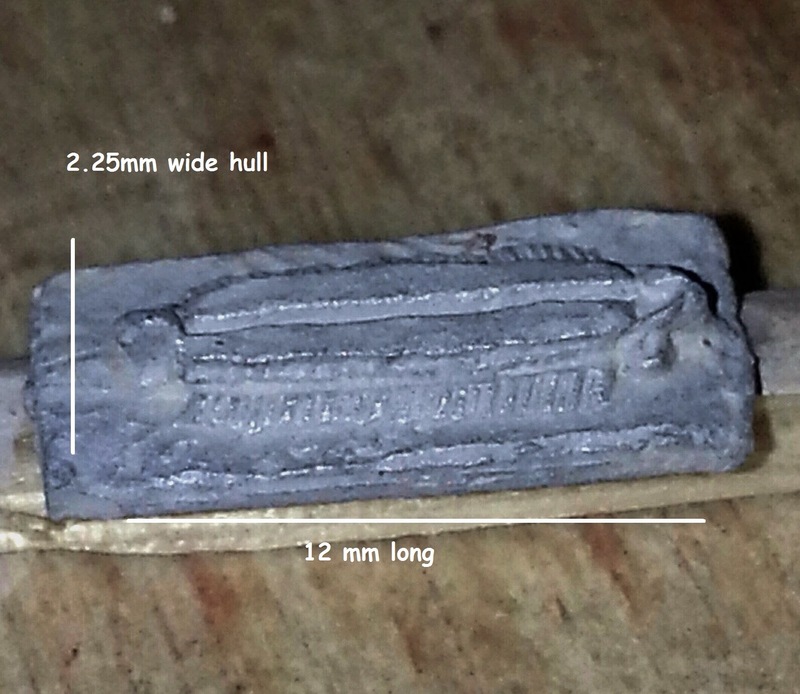 Each ship is 12mm long and so in terms of scale 1/3066 if the miniature is taken from Olympias, which it appears to be , but no problem for the nominal scale 1/3600. You can see below how much detail they have managed to put onto this small miniature. I painted them with acrylics and a size 1 brush, using a magnifier. Maybe smaller brushes would allow more detail but I want to paint a load quickly. It is also difficult to see very small details on the finished item - especially with my eyes - so excessive detailing is wasted. Only 9 passes painted 20 in a couple of hours. a dark line either side of upper hull. sea base is white with cobalt blue swirled into it. white oar tracks - not so realistic but give impression of movement and point to rear, helpfully. The results are fine. Individual ships may not bear close inspection, but not many play a game with magnifying spectacles on ! En masse they look great. 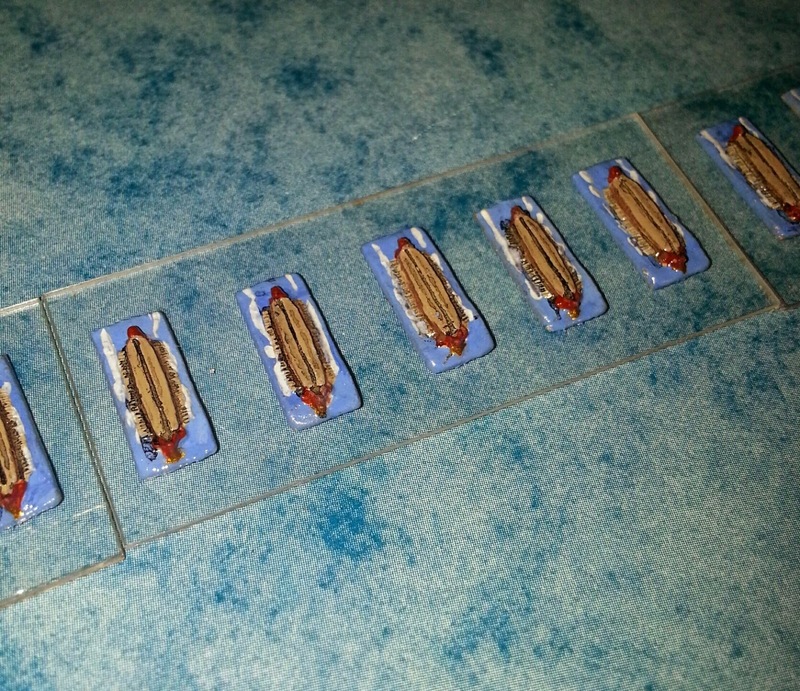 I normally use bases of acetate. Thicker than a photocopy transparency but not as thick as perspex. When the light does not reflect too harshly they look fantastic, he said humbly. Outpost's little model is great. I will be trying the others for the Hellenistic and Punic Wars battles. 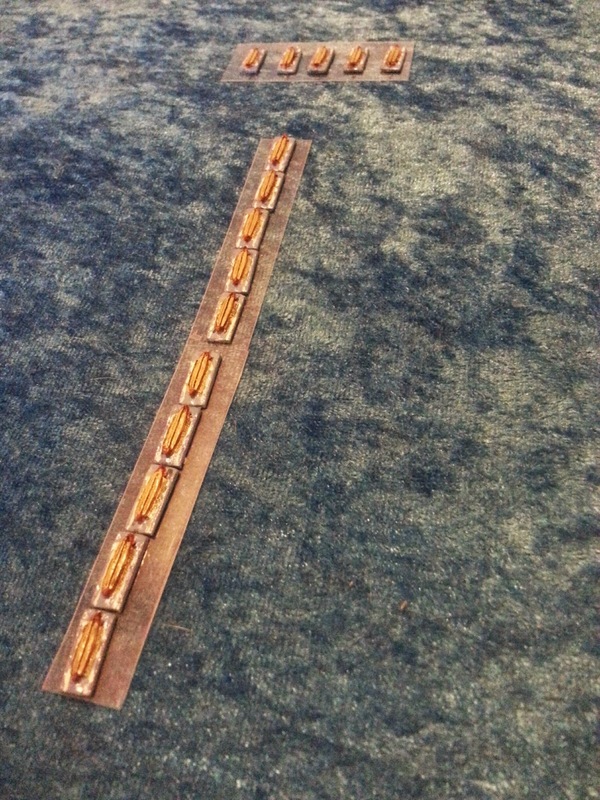 Now I have admitted the scale of 1/3000 is necessary for doing 1:1 battle refights these miniature seem ideal. 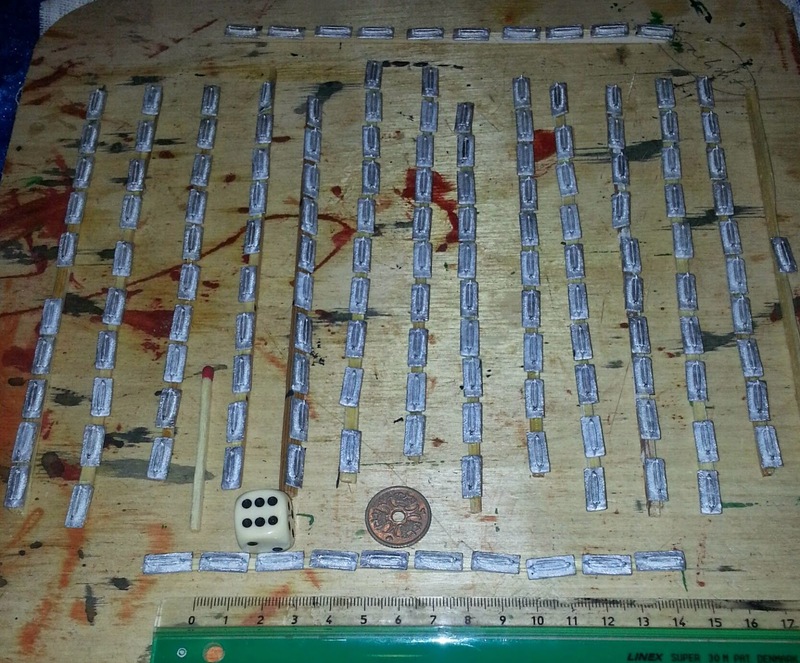 Others I will try are TUMBLING DICE with 1/2400 ships that may still fit on my bases and allow a more detailed paint job that is more visible. Finally, 1:1 fleet battles almost at hand! 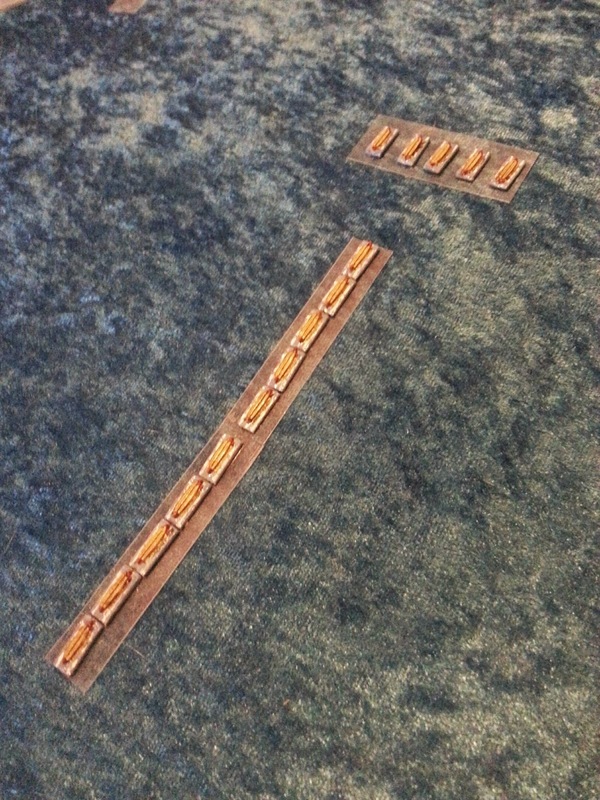 Wargame blogger STEEL ON SAND also has a review of more of Outpost's galleys. 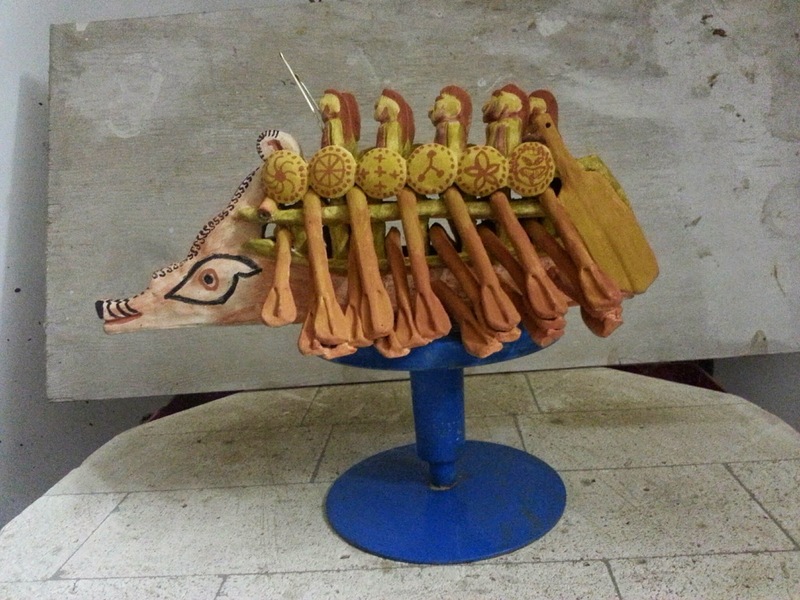 The terracotta model that is in the Danish National Museum and known as the 'Erment Model' was fuel for a debate in the long-running saga af the ancient galley. 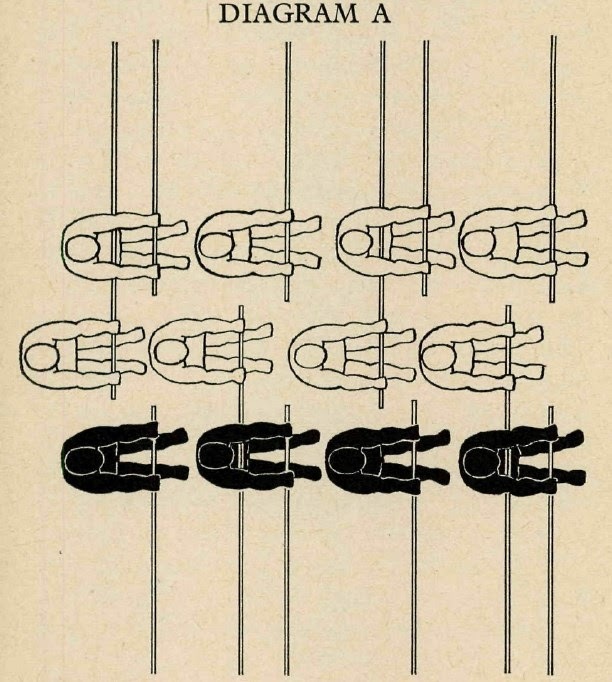 Lucien Brasch argued in 1969(1) that the model supported the idea that there was more than one type of trieres. His reasoning was that the Greeks had their own interpretation of an original idea by the Phoenicians. The model was found in Egypt and must represent a trieres tradition from the eastern Mediterranean which differed from the Hellenistic variety. 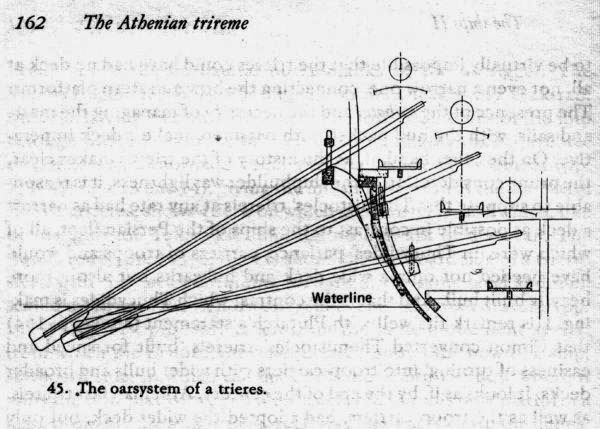 Just how one could make an alternative trireme is a bit of a puzzle but not beyond ingenuity. We have today the advantage of having seen a working trieres in the form of Olympias (2) and must admit that this colours our vision. Notwithstanding this, there are still critics such as Alec Tilley(3) who have alternative suggestions for how a trieres could be constructed on other lines. Tilley thinks the Erment model could therefore be a hexeres ! (x) With two men on each oar because only with such a large number of men and oars would tiers be necessary. After Brasch the Erment model is seen as supporting a version of the trieres which is first seen on the Sennacherib stela from Nineveh and that show the flight of Luli from Sidon. It is narrow and high, with no apparent outrigger - the parexereisea. 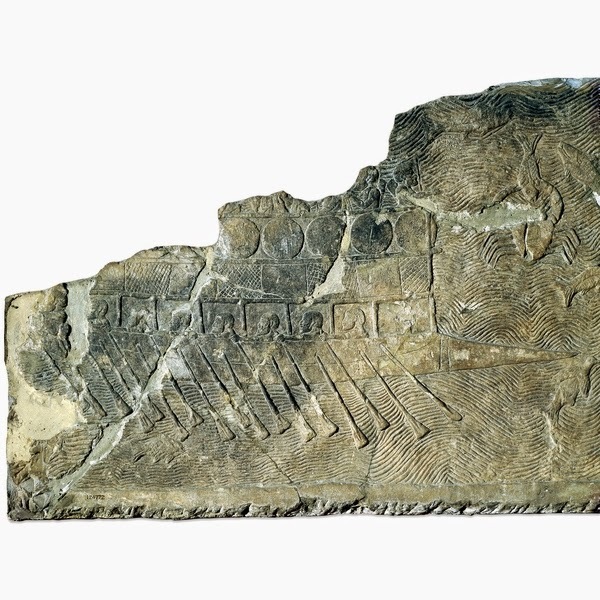 Even 'The Athenian Trireme' supported the idea that there is a an unused tier of oarplaces in these reliefs. Odd. If one is fleeing why not use full speed? A rather unbelievable illustration of these ships was given in the Osprey New Vanguard 196 'Warships of the Ancient World' book. In 1975 Alan Lloyd(4) pretty much knocked the 'Phoenician trieres' theory into touch with his thorough-going rebuttal of Brasch's paper. It includes a quote from R.C. Anderson's 1962 paper(5) which is rather damning. viz. 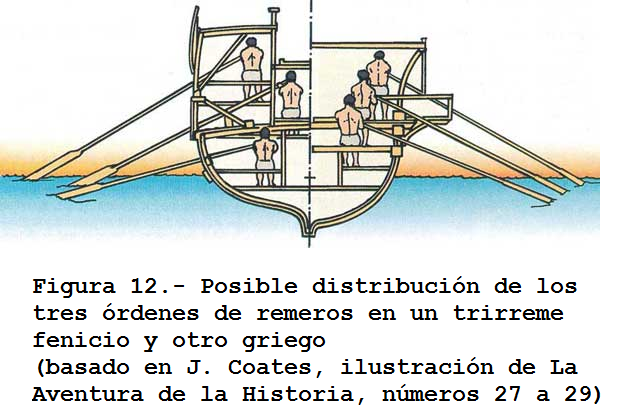 The model has also been used as a possible blueprint for an eastern Mediterranean penteres (7) which is supposed to differ from the Syracusan version by, again, having no outrigger and with double-manned upper oar-tiers. Making the model gave me a little insight into the potter's task. Forgetting any high ideas about an accurate scale model - the concept of which was probably some way ahead in history from when the clay ship was produced. As any clay structure is built up it tends to sag under its own weight. One can avoid this by a) avoiding overhangs and b) ensuring all points are supported from beneath c) making the structure lighter in the top. I think the Erment model has its final shape because of these factors. The original profile of a trieres is almost impossible to make in a model of this size if one is not going to take time-consuming steps to support it and let it dry progressively as one builds. Looks Ementish but WRONG. From Napoleon III's reconstruction of 1882 by Admiral Serre. A classic failure. Profile of Olympias by John Coates. Too broad for a clay model. This is no problem for some smaller, more primitive ship models. Pottery has alway sbeen a lowly trade and pot items very cheap. The idea of taking an inordinate amount of time on a cheap votive item is unlikely. 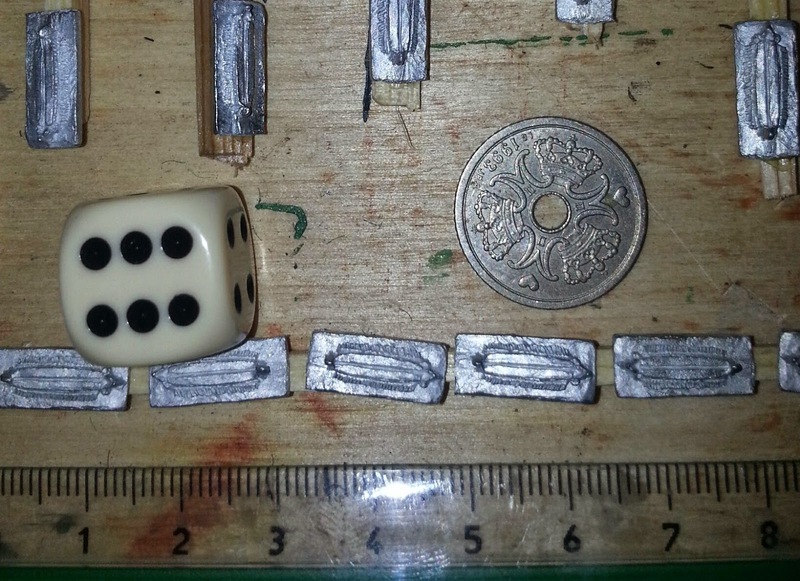 I also think the Erment model does have an outrigger but it is misunderstood by the maker. AND transformed so that it fits with the clay's characteristics. 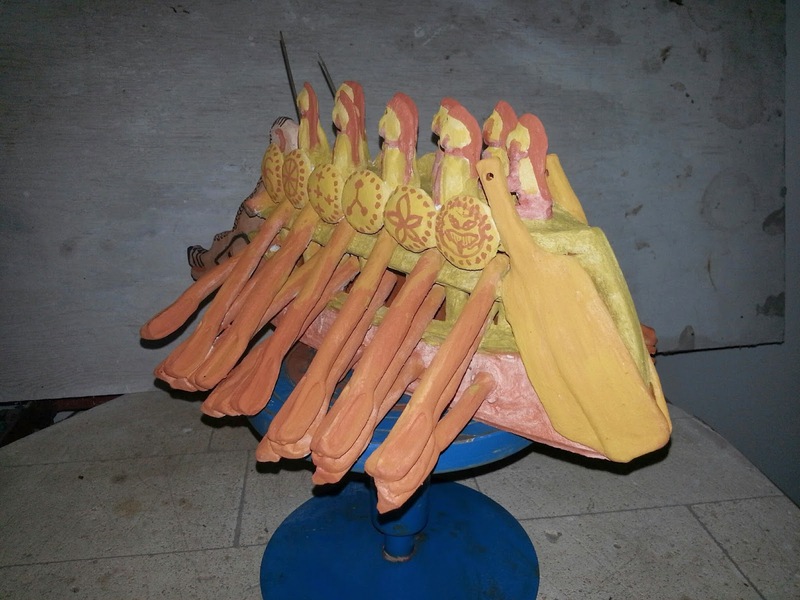 Instead of the oar tiers being set further outboard as in the real thing, the model has them set over each other for the sake of constructing something easily from clay. 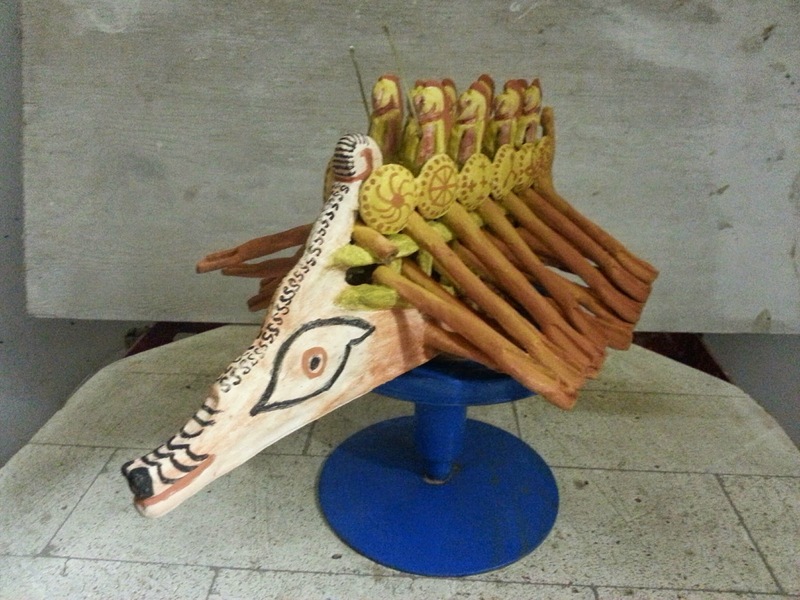 The strips supporting the upper two tiers are there because they look like they should be there when one looks at a real trieres but they are also necessary to support the oars in the model. They cannot be set out from the hull or the thing will sag and break so they are set over each other. They show a gunwale and an outrigger but they cannot be set out from the hull or the whole lot will collapse. The epibatai (which could aequally have been the hyperesia) must be set on last. 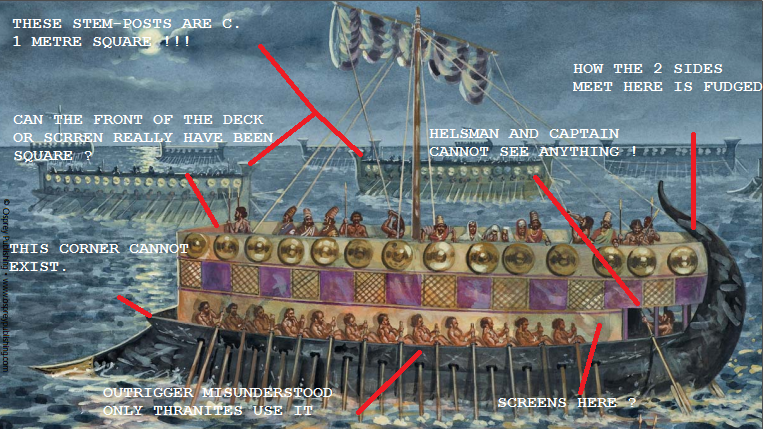 When the decks have dried a little and gained some strength the figures and shields can be glued -on with slip without fear of collapse. The ship's profile is explained by these factors also. It is flat-bottomed because it must stand solidly as it is built. It is high and stright-sided because an open, low form will collapse unless a time-consuming process is adopted for construction. I would say the modeller wanted to give a good impression of a trieres and he does. It is a slim, sleek ship with many oars. It has a fierce prominent ram and efficient prominent pedalia which look like they can really affect the ship's progress. Version 2 may be painted to look a little less like Sonic the Hedgehog! 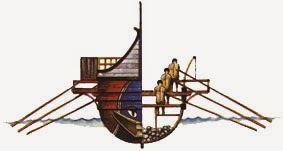 Along with the many odd-shaped clay ships i think the Erment model has to be considered just that. In the broadest sense of the word. It is not a scaled-down copy of any ship, penteres, hexeres nor trieres but it is a representation interpreted by the non-sea-going potter and made within the limits of the chosen material. This trieres really does have feet of clay.